Catherine's music is known for its programmatic nature, raw emotions, intricate rhythms and driving energy. Her works have been hailed as highly complex yet immediately engaging. Random Audio Sample: Out of the Woods? : toccata for horn trio by Catherine Likhuta, from the CD Selected Works by AMC Represented Artists, vol. 77. Catherine Likhuta is an Australian-based composer, pianist and recording artist. Her music exhibits high emotional charge, programmatic nature and rhythmic complexity. Catherine's works have been played throughout the United States, Europe and Australia, as well as in Canada, Mexico and Brazil. Her music has enjoyed performances by many prominent soloists (such as Trish O'Brien, Paul Dean, Peter Luff, Brent Miller, Adam Unsworth, Griffin Campbell, Ronald Caravan and Emma Di Marco), chamber ensembles (such as HD Duo, Horn Hounds, Barega Saxophone Quartet, Collusion, Western Brass Quintet, Atlantic Brass Quintet, Best of Brass, U.S. Army Field Band Horns and Queensland Symphony Orchestra Horns) and large ensembles (such as The Australian Voices, University of Georgia Hodgson Singers, Cornell University Wind Ensemble and Wind Symphony, Queensland Conservatorium Wind Orchestra, University of Georgia Hodgson Wind Ensemble, and Orchestra of the National Radio of Ukraine). Catherine's pieces have been played at many international events, including four International Horn Symposiums and two World Saxophone Congresses. In recent years, she was the winner of the International Horn Society Composition Contest (virtuoso division) and the recipient of several awards and two grants from the Australia Council for the Arts. In 2017, she was selected as one of four Australian composers for the highly competitive Melbourne Symphony Orchestra's Cybec 21st Century Australian Composers Program. Her music can be heard on Cala, Albany and Equilibrium Records. Catherine holds a Bachelor's degree in jazz piano from Kyiv Glière Music College and a five-year post-graduate degree in composition from the Tchaikovsky National Music Academy of Ukraine (Kyiv Conservatory). 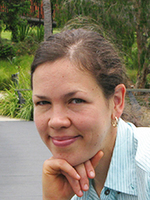 She is currently pursuing a PhD in composition at the University of Queensland. She has delivered presentations on her work at a number of institutions, including University of Georgia, Queensland Conservatorium Griffith University, Cornell University, Ithaca College, Arizona State University, Syracuse University, Butler University, Bowling Green State University and 50th International Horn Symposium. Catherine enjoys performing as a pianist, often playing her own music. She was the soloist on the premiere of Out Loud, her piano concerto commissioned by the Cornell University Wind Ensemble, and the pianist on Adam Unsworth's CD Snapshots. On a recent joint tour with Adam Unsworth, Catherine gave recitals at Eastman School of Music, Northwestern University, University of Michigan and Temple University. Catherine's most representative works are Out of the Woods? (2011), toccata for horn trio, and Scraps from a Madman's Diary (2016), secular oratorio-drama for chamber SATB choir and wind band. Rituals of Heartland : orchestra (2017) Commissioned as part of the Cybec 21st Century Composers Program. Lesions : for clarinet, horn and cello (2017) Commissioned by Paul Dean for performance by Ensemble Q. Bad Neighbours : chamber concerto for 6 horns (2017) Commissioned by Horn Hounds. Out of the Woods? (trios: clarinet, piano, cello) (2017) Commissioned by Endeavour Trio.